There are few machines in your home that are as complicated as your garage door. This system consists of many interconnected parts, from tracks and rollers to springs, cables and the opener, which serves as the engine of the entire operation. As you can imagine, there are many ways in which this type of system can malfunction; motor gears can wear out, lift cables can become frayed and the tracks can become bent and prevent the door from moving. Our technicians have the experience and the expertise required to quickly identify the root cause of any problem, and apply a fast and effective solution. One of the most common problems faced by homeowners is worn out or broken door springs. These components are responsible for bearing the door’s weight and helping it rise and descend, and since the average garage door weighs around two to three hundred pounds, this is a significant load. Although they are significantly tough, these springs will weaken and wear out as time goes by; their longevity will depend on a few factors, mainly their type, manufactured quality, and how often they are maintained. It’s essential to call our technicians if you notice any signs of weakness, as these components can be extremely dangerous, and spring replacement is the type of task that must only be carried out by experienced professionals. The most complex part of your overhead door system is the opener, which controls both powers and controls the operation. When something goes wrong with this device, it can be very difficult to identify the issue; it could be a faulty circuit board, damaged wiring, or a problem with the safety sensors. Our technicians have a lot of experience working with all the major brands, including LiftMaster, Genie and Chamberlain, and we can quickly identify what the cause and address it accordingly. A bent track can prevent your door from moving smoothly, or at all, depending on the severity of the damage. A dented or broken panel can really spoil the visual appearance of your door, and may even compromise its protective capabilities. Our technicians can get rid of dents quickly and easily, and even replace entire panels and tracks if the situation calls for it. No matter what problem you’re experiencing, our team is ready to help. 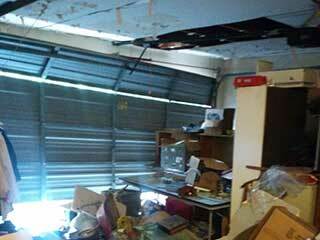 Give Garage Door Repair Katy a call to have our technicians fix your system and bring it back to its fully functional state.